Do you love succulents? If so, you may be interested in a contest that my friend Jacki from Drought Smart Plants is currently running. Great Succulent Contest from my Friend’s website. Succulents are one of my favorite plants. I lived in Australia for 15 years, this type of plant was very commonly grown there, both in planters and in garden beds. Alas, I can’t over winter them here in NC because of the frosts that we get but they are still a great love of mine. Succulents store water in their leaves and stems (some even in roots) which enables them to survive unfavorable growing conditions such as severe drought. 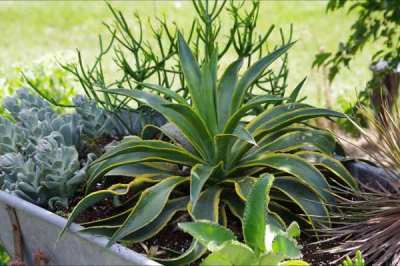 Succulents are often grown as ornamental plants because of their striking and unusual appearance. 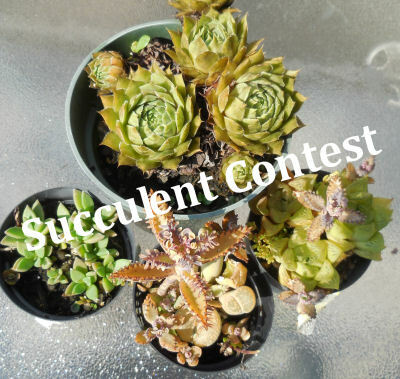 Jacki’s contest asks you to share your great ideas that you use to display your succulent plants. The planter can be for single succulents or a mix and match container. Can you improve on this? If you think so, head on over to Drought Smart Plants and enter her contest. Hurry though…the contest ends August 31, 2013. I look forward to seeing this year’s winner. Perhaps it will be someone from The Gardening Cook’s Facebook page!